CARACAS - Venezuela's socialist President Nicolas Maduro announced on Monday the creation of a new popular assembly with the ability to re-write the constitution, which foes decried as a power-grab to stifle weeks of anti-government unrest. "I don't want a civil war," Maduro told a May Day rally of supporters in downtown Caracas while elsewhere across the city security forces fired tear gas at youths hurling stones and petrol bombs after opposition marches were blocked. Maduro, 54, has triggered an article of the constitution that creates a super-body known as a "constituent assembly." The opposition had been demanding general elections to try and end the socialists' 18-year rule. A grave-faced National Assembly President Julio Borges on Monday evening called on Venezuelans to rebel, potentially portending bigger protests. "This is a scam to deceive the Venezuelan people with a mechanism that is nothing more than a coup," Borges said, urging Venezuelans to block streets early on Tuesday and hold another march on Wednesday. Opposition supporters on Monday night were also banging empty pots and pans from their windows in a traditional Latin American form of protest. Tulane University sociologist David Smilde said Maduro's announcement was a "pretty clever" move to dodge conventional elections which could both appeal to government hardliners and ease international pressure on him. "It is sufficiently complex and ambiguous that it might freeze some countries in the international community who think this might be a concession to the opposition, or represents an autonomous political process and should be respected," he said. "It is a transparent attempt on the part of the government to skirt elections it knows it will lose," he added. "For no reason, they are starting to repress us," lawmaker Jose Olivares said via a video on Periscope, as demonstrators took cover behind trees and walls and opposition lawmakers streamed video of the protest from their phones. Elsewhere, the National Guard blocked marchers pouring towards a major highway in front of the Avila mountain which towers over Caracas' northern edge. Opposition supporters cheered as youths ran to the front, carrying makeshift shields made from trash bin lids, wood and even a satellite dish. Others blocked roads in Caracas' wealthier Chacao area with branches and fences. One woman loaded Molotov cocktails from a beer crate onto a motorbike where two men took them to the front line. 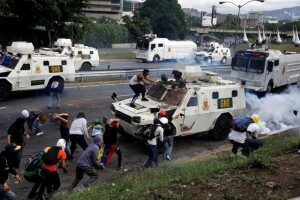 As well as elections, government opponents are demanding autonomy for the legislature where they have a majority, freedom for more than 100 jailed activists and a humanitarian aid channel from abroad to offset Venezuela's brutal economic crisis that has food and medicine running short. In central Caracas, where the socialists have traditionally held their rallies, thousands of government supporters cheered a huge inflatable doll of Chavez and railed against opposition "terrorists." "The workers are in the street to defend our president against the violent coup-mongers," said Aaron Pulido, 29, a union worker with migration department Saime, in downtown Caracas among a sea of red banners. Some government workers acknowledged they had been coerced into attending Monday's pro-Maduro rally. "We're here because they tell us to. If not, there are problems," a 34 year-old employee with a state aluminum company, just off a bus after an all-night journey from southern Ciudad Bolivar, told a journalist until a supervisor cut off the conversation. "Who can stand this? So much hunger, misery, crime ... The prices are going up far more than the salary rises," said social security worker Sonia Lopez, 34, at the opposition demonstration in west Caracas, as she waved a Venezuelan flag signed by now jailed opposition politician Antonio Ledezma.